Brush and ink on Bristol (maybe) ACEO. Erased pencil lines too soon, smudged ink. Realized too late shouldv'e had more stars in upper reaches. Pleased with the hands. May have to redo it any way though. Also for Inktober. Tara N Colna says: Love it!!! Thanks so much for doing my prompt. (I smudged in on one of mine today too)	~ Reply? Afke says: I love this; the concept and the angle, awesome! 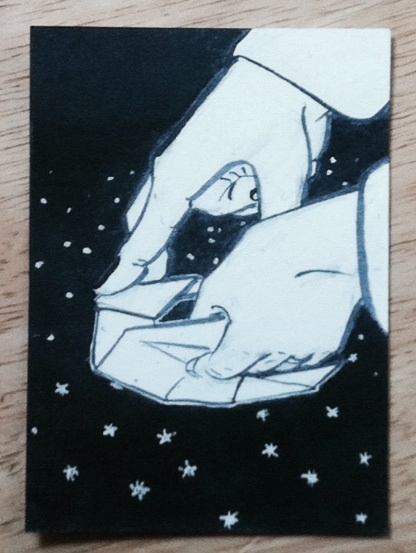 Let me know if you still have this or if you redo it, I'd love to have an ACEO of this. ~ Reply? Kir Talmage replied to this: Oh! Thank you! Print or original? (I just now saw the comment). I will see about making both available, but it might be a little while since I'm a little swamped. The real one is not blue, but rather a nice paper whiteish cream color. I will try to get a good scan, too, so you really know. Kir Talmage replied to this: OK, the original is up and for sale through Sketchfest. I will see if I can make prints on any paper worth having. I do know I have fairly nice photo paper, possibly even archival, not sure what else. Afke says: The EMG print has a high quality, I am very happy I finally have a copy of this picture in my possession. Thanks! ;)	~ Reply? Kir Talmage replied to this: Huzzah; glad you like it!